If you require electricity, you will also be limited to a few campsites with power hookups. Please let the staff know before arriving if this is the case so we can reserve a spot for you. Also please keep in mind that not all attendees of the festival will keep the same hours as you! 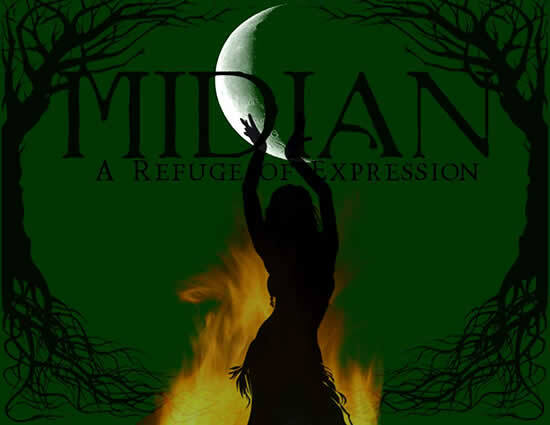 The most active area, by day and by night, is the open main event space in the heart of Midian. This is where workshops, performances, vendors, and the fire will all take place. We ask that all attendees be courteous, though, in the wooded camping areas after sunset, as many folks might will sleeping. Q): Will my campsite have a firepit? A): If you arrive early to the festival there is a very good chance that you will have access to a firepit at your campsite. If you are arriving to the festival later, you may still have access to the firepits, but may need to share with others. Q): Is there internet service at the festival location? A): Sadly, not yet. This is one of the amenities that Midian, as a new venue, isn't yet able to provide. It's on the list of intended improvements, though! Q): Is there cell phone signal at the festival location? A): Not much. Your mobile carrier may provide more reliable signal than ours, though. A): Weather is notoriously unpredictable in Southern Indiana. Past experience has taught us that you should plan for all types of weather: hot & dry, hot & wet, cold & dry, and cold & wet. Be sure that your tent/shelter is waterproofed, and dress in layers. Bring an extra towel! Q): Where can I buy supplies near the festival? A): Firewood is available to purchase on-site at the festival. There are several nearby options for gas, ice, and groceries. Q): Can I stay off-site for the festival? A): Yes! Both Bloomington and Bedford are within an easy drive from Midian.